Peta, of the blog Peta Eats, was our lovely hostess for the Daring Cook’s September 2011 challenge, Stock to Soup to Consommé. We were taught the meaning between the three dishes, how to make a crystal clear consommé if we so chose to do so, and encouraged to share our own delicious soup recipes! This simply stunner of a recipe is perfect when you want to impress the socks (shoes, ties, belts, you name it) off your guests. The flavors sing the praises of autumn, but upon first sip, you’ll notice that the soup is as light as air and almost reminiscent of spring. It’s the kind of ethereal taste that makes you feel as if the chef slaved for hours and hours perfectly balancing flavors and textures. And yet, as you’ll see in the steps below, you couldn’t ask for a more simple or straightforward process. July 24, 2011 Angela G.
Hot and sour soup gets the bum rush – most places that craft it poorly do so by phoning it in. It’s so simple to the point that it’s ludicrous that it could be butchered, and yet I’ve been affronted with some shady knockoffs standing in for the real thing. Rather than flirt with disappointment, I just whip a pot up myself and call it a day. No more fishing out rubbery tofu and incredulously huge pieces of celery (what the eff?) Just hot and sour action at its best. Brilliant! June 6, 2011 Angela G.
In that I am an avid dumpling maker (so that I can afford to be a voracious dumpling eater), I tend to go through quite a bit of filling for the little buggers. Much like the hot dog/hot dog bun conundrum (12 hot dogs vs. 8 buns), I often find myself with more filling than I have wrappers for. What to do?!? Given that the filling does not tend to keep very well (overnight at best, and never defrosted from frozen), I have found a quick and easy solution with wontons. The wrappers are easy to come by in the produce section of the market (usually with the tofu) and can be transformed into the loveliest of soups. In Chinese, wonton means “swallowing a cloud” – easily the perfect descriptor for a soup that is both complex and delicate at the same time. So what’s the game plan, you may ask? Very simple. 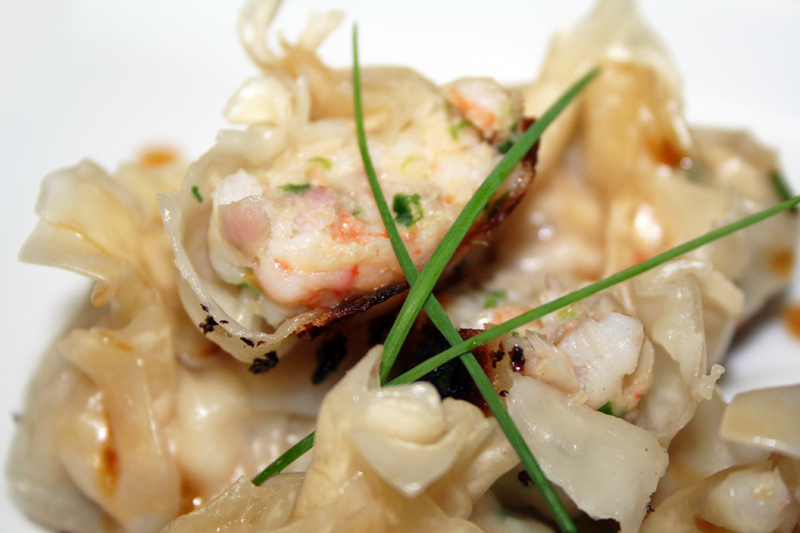 Bolster your leftover filling with some fresh shrimp, sesame oil and cornstarch. 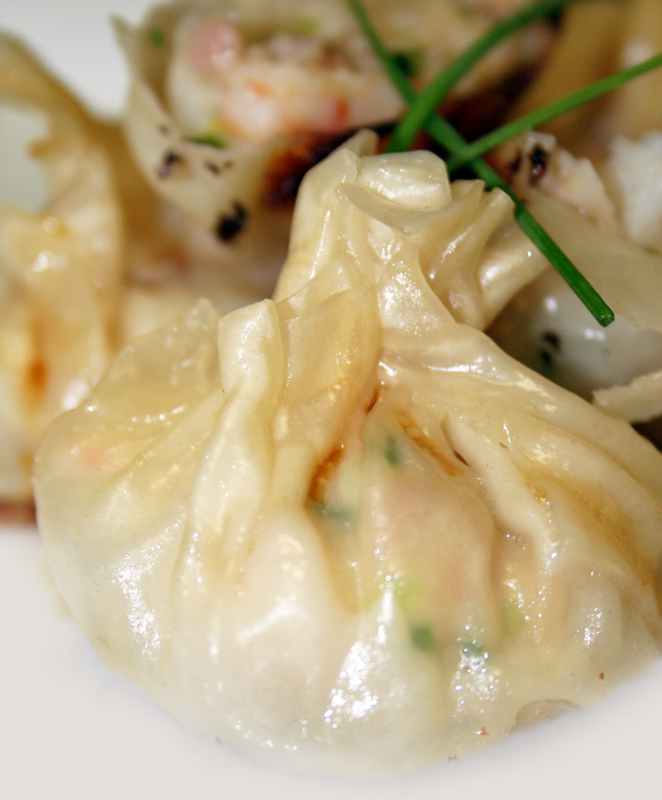 Fill the wonton wrappers and twist into little satchels until you are out of filling. Freeze the wrappers (as these guys do keep well) and make a pot of wonton soup. If you have leftover wontons beyond the soup, either pan fry and serve with soy dipping sauce or deep fry and serve with duck sauce. Last but not least, relish in your delicious frugality and trenchant wit. Probably the most important step of all. Pour the chicken stock, soy and ginger into a pot and bring to a boil. 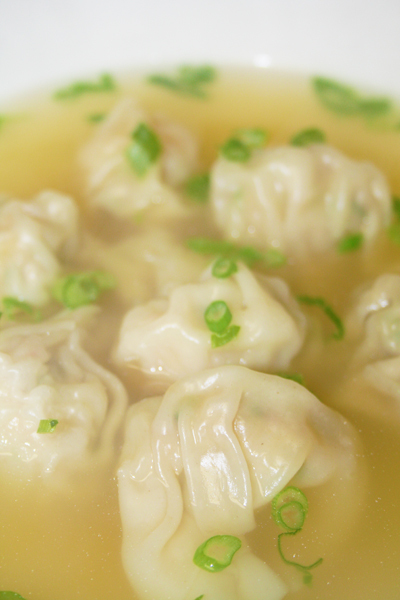 Add as many wontons as you’d like to eat (no more than 10 per quart of stock) and cook for 4-5 minutes. Ladle soup into bowls and top with a handful of scallions. Dig in. May 22, 2011 Angela G.
Of the dishes that I crave in an almost manic way, pawing the walls like a crackhead needing a fix, wonton noodle soup is always on the top of the list. 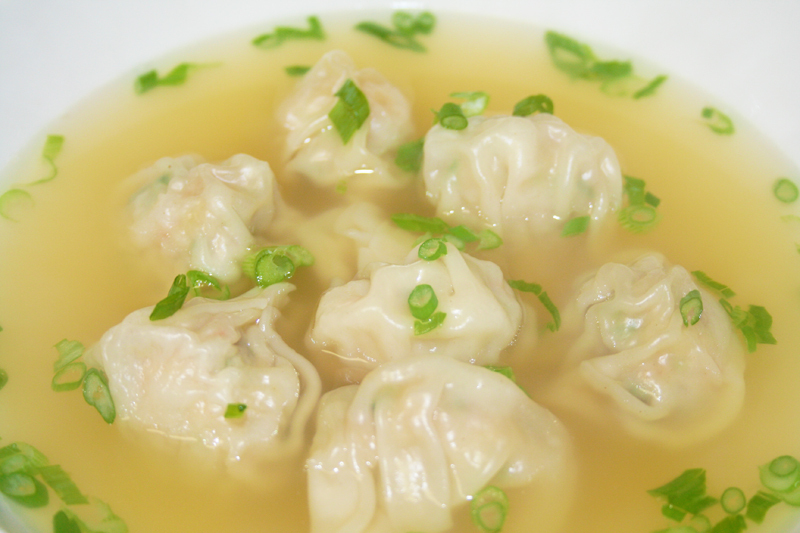 In college, it was brimming bowls of Cantonese Wonton Soup from Ollie’s Noodle Shop in NYC. The broth studded with crisp shallots and baby spinach featured the most lovely shrimp and pork wontons – I willingly braved the lines and the brusque service just to get my weekly fix. It was hard for me to imagine a wonton soup better than it, but once I tried the Roast Pork Wonton Noodle Soup at China Fun (also in NYC), I fell head over heels in love. Blubbery udon noodles, tender slices of barbecued pork and spinach and scallions swimming around in a steaming bowl of broth. And those wontons. God, I have dreams about them – I felt a Robert Rodriguez-style need to march right into the kitchen and shoot the cook as the rest of the world didn’t deserve to eat anything so damn good. *in my best Sophia Petrillo from the Golden Girls voice* Picture this, Tuscany 1952, you’re in need of a dish to feed your family and all you’ve got is the minestrone from last night, some stale bread and an old prosciutto bone lying around. What do you do? Make only the most delicious soup imaginable, quite possibly better than that minestrone from the night before. But seriously, kids, how lovely is it when a great plan comes together. A few pantry ingredients, maybe even some leftovers and a bit of time putzing around the kitchen and voila! Gorgeousness on a plate, or in this case, a bowl. 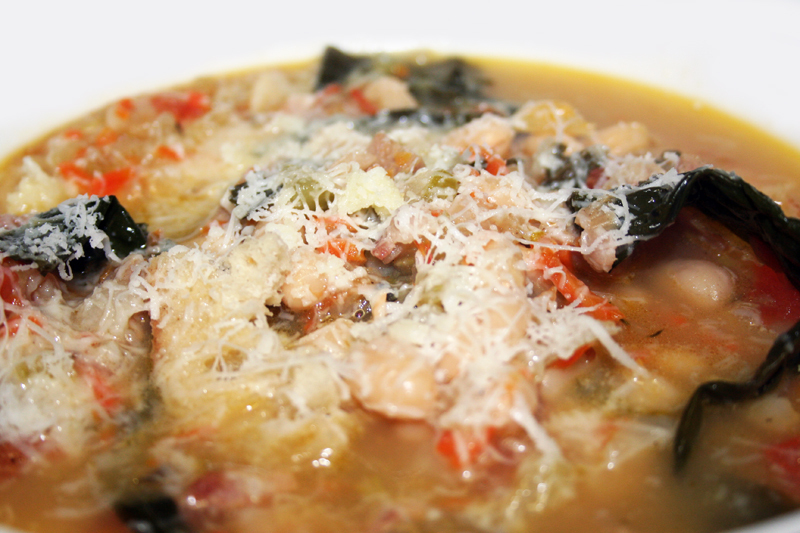 The name itself gives it away with this one – ribollita is Italian for reboiled. Any glamour and cache that this soup might garner from its placement on modern Italian menus is only a recent distinction – the dish has the humble origins of true peasant food. Just as in Brazil, a pot of black beans can be extended for additional eaters with some water and a little more rice, this soup is extended by day-old bread soaking up the rich vegetable broth. A smidge of good quality cheese (which you regular readers know that, for me, is a smattering of locatelli) and you are in like flynn. There are much fancier versions than this one, but I love this recipe because it’s a weekday charmer. No prosciutto bone here, and a parmesan rind only if you have one around. Black kale (cavolo nero or dinosaur kale) is the star of the show, but can be replaced by any kale or bitter greens you can find. Canned beans and pantry chicken stock speed along the process, and by dicing everything in the food processor saves a hell of a lot of time. In addition, if you leave out the bacon and chicken stock, you’ve got a comforting vegetarian supper on your hands. No cheese and it’s vegan. A warm bowl of love for all sorts of eaters? It doesn’t get any better than that. Heat a large soup pot or dutch oven on high and add your olive oil. Once it begins to shimmer, toss in your bacon and allow it to crisp up a bit. Add your onions and cook until translucent. Add the carrots and celery and cook until fragrant. Add your tomatoes, rosemary and thyme and stir to warm through. Lastly, add the stock, parmesan rind and cannelini beans. Allow stock to come to a boil and fold in the black kale. Cook until kale is tender over medium-high heat, about 15-20 minutes. 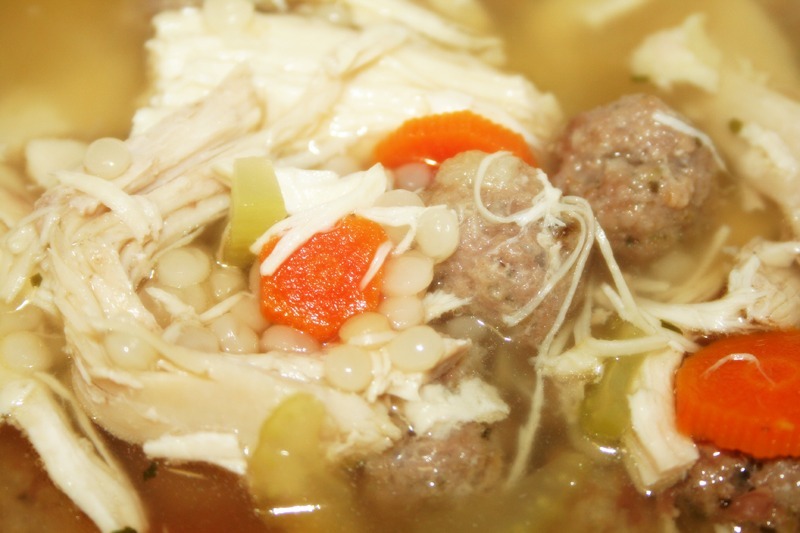 To serve, place a few slices of ciabatta (or hunks of old bread) on the bottom of a soup bowl. 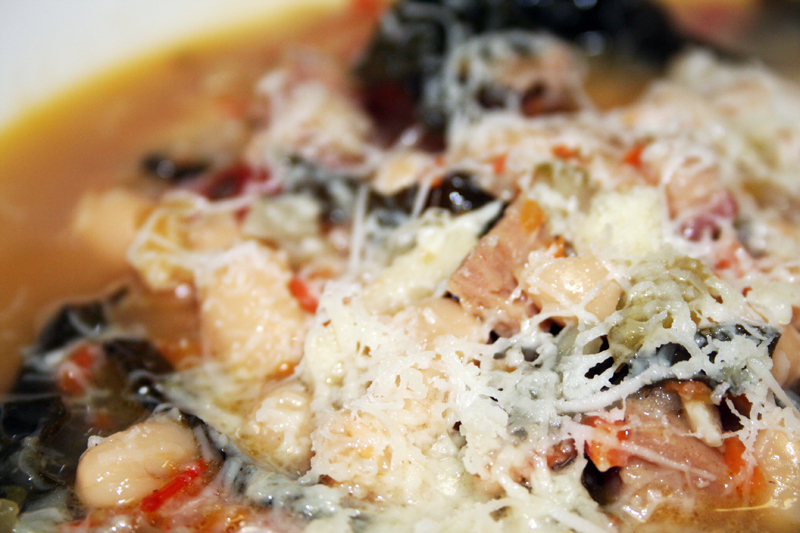 Ladle hot soup over the bread and top with grated parmesan. 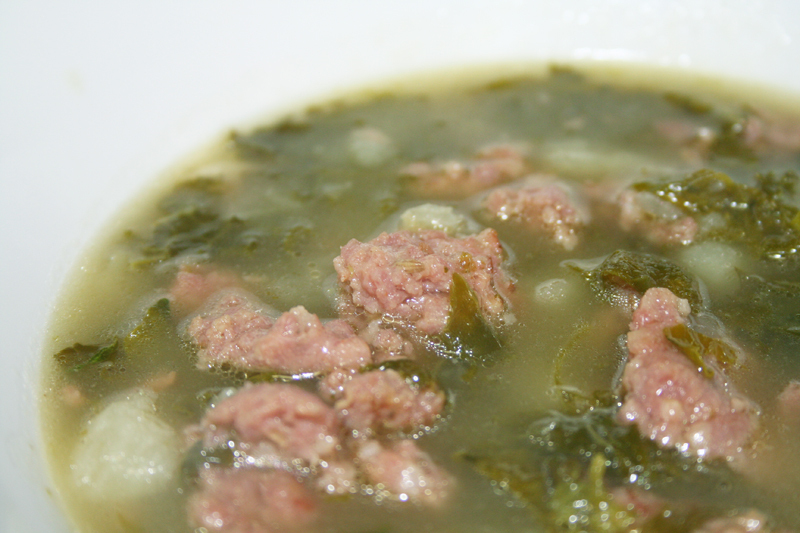 Like Italian Wedding Soup, Caldo Verde is a celebration of meat, greens and broth, with the star carb as tender, simmered potatoes. This soup is as hearty as it is easy to make, and a great use of winter kale when in season, cheap and plentiful. The soup, Portuguese in origin, traditionally uses linguica for the sausage, but I’ve made this in a pinch with kielbasa, andouille, chorizo and even Bruce Aidell’s chicken sausage. Regardless of what ingredients you employ, you can expect a warm, nourishing bowl of comfort that is both simple to prepare and good for you. Bring quarts of chicken stock to a boil. Toss the potatoes, garlic and kale into the pot. In a sauté pan, brown the sausage until crumbly and no longer pink. Drain the grease from the sausage and add the meat to the soup. Simmer until the potatoes are very tender, about 20 minutes. Using a potato masher, mash the potatoes right in the stock pot until the potatoes are loosely mashed. Serve.